I am steadily moving West after starting in Missouri, looking at the difference between the USHNC average temperatures for each state, and comparing this with the GISS average. Along the way I am looking at the data itself to see if it provides further information. Having done Kansas and Colorado I have now reached Utah, and while I initially ran the numbers for the state using the homogenized data that USHCN provided, I am now repeating the analysis using the temperature data that has only been adjusted for time of observation (TOBS) and not the further adjustments that have been made to the data, and that I will discuss in a later post, when I have more information. There are 40 stations in the USHCN network in Utah, but only one GISS station that Chiefio found in his listing, and that is in Salt Lake City, so if there is an Urban Heat Island effect then this should show up. I have described the process in getting the data in the first and Missouri-revisited posts, and so I will just move on to note the differences that using close to raw data has on the comparisons, relative to using the massaged data that I wrote about in the earlier post. 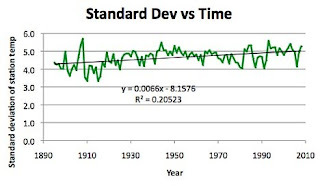 The average difference between the GISS station and the USHCN network was 4 degrees (F) in the original comparison, with the TOBS data it has dropped to 3.8 degrees, but the trend is still overall downwards - interesting that there is that drop around 1950 which showed up in an earlier state, without which the trend would have been more consistently upward. 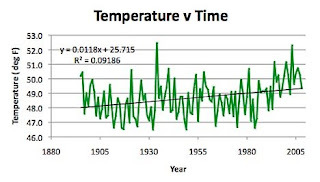 And in terms of the change in temperature in the state over the years, this was fairly clearly rising in the massaged data (r-squared 0.27 for a linear relationship) with the TOBS data the rise is clearly not as consistent over time, but only seems to have picked up after the 1980’s. 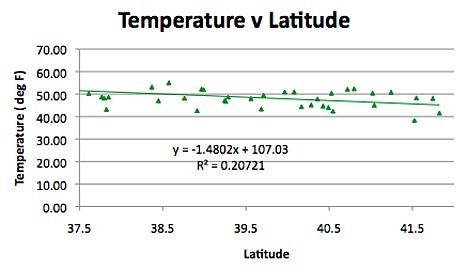 The ingoing hypothesis at the start of the earlier Utah post was that in the higher elevations there would be less correlation with longitude, and there was sensibly none, that has hardly changed. 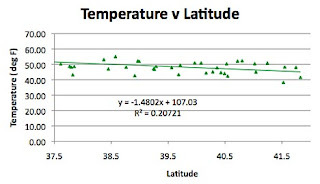 The other correlation has been with latitude, and the trendline shows sensibly the same gradient, though with a better correlation. One of the questions has been whether the quality of the weather station data has improved with time, and I use the standard deviation of the data as a way of measuring this. 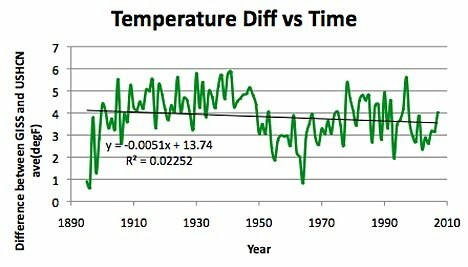 There was sensibly no change over the measuring period with the massaged data, but when the TOBS data is used, there is a clear upward trend over the measuring period (which would argue for Anthony Watts position). Which raises a bit of a question about the massaging, but we’ll leave that for now. 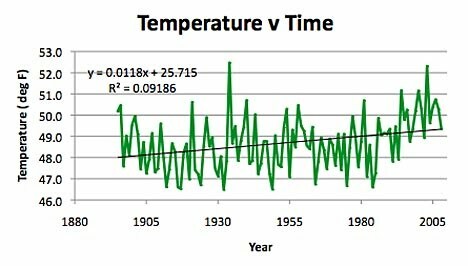 Which only leaves the question as to the correlation with population, one of the relationships that the USHCN was supposed to remove, but which still appeared in the massaged data for this state. And it is still there, interestingly not quite as well correlated with the rawer data of the TOBS set. Well we will press on and see where this all leads.